Northeast Cape Air Force Station (1953-1969) - A Cold War U.S. Air Force Station, part of the Alaska AC&W Radar Network. Initially functioned as an Early Warning radar site, with a Permanent System ID of F-09. Located on Saint Lawrence Island in the Bering Sea, just south of the Bering Strait. Closed in 1969. 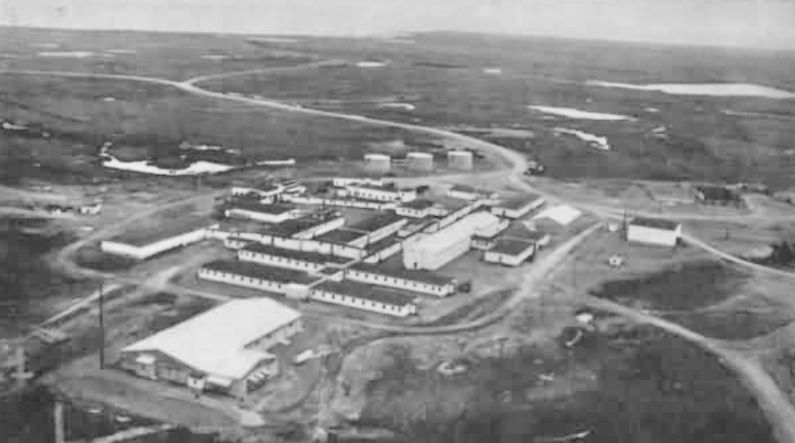 Northeast Cape Air Force Station Lower Site circa 1963. A contract for construction of the radar site was awarded in January 1951 and construction began on a split site with a lower cantonment area and an upper main site. Detachment F-9 of the 142nd ACWS, ANG, provided security for the unfinished site late in 1951. Construction was completed and the site became operational in December 1952. The Northeast Cape Air Force Station was then manned by the 712th AC&W Squadron which had been activated in December 1952 to operate and maintain the site. Initial radar equipment on the upper site included a FPS-3 (SN #17) search radar. The FPS-3 radar was upgraded to a FPS-20A search radar in 1963. IFF/SIF equipment was UPX-7. Radar scopes included OA-99s and later UPA-35s. In 1965 the FYQ-9 Semiautomatic Data Processing and Display System was implemented on Alaska AC&W radar sites automating the passing of track data to the direction centers. The result was reduced manpower requirements and increased efficiency. The Northeast Cape AFS was closed in Sep-Oct 1969 and the 712th AC&W Squadron was deactivated. Operation of the site was transferred to the White Alice Communications System (WACS) contractor who had been co-located with the AC&W Radar Site. 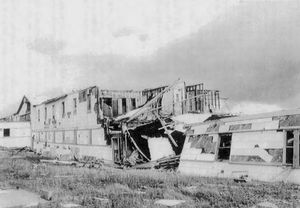 The site was finally abandoned in 1974. Northeast Cape AFS Top Site Tram Terminal. The physical plant of Northeast Cape AFS was originally divided into an upper main site and a lower cantonment site. The upper main site housed the radar towers, backup generators, communications sites and crew quarters. The cantonment area housed the lower operations area, the enlisted quarters (BAQ), the bachelor officer's quarters (BOQ), the orderly room, the dining hall, recreation facilities, and other support areas. A small airstrip provided facilities for fixed wing aircraft and helicopters. Most of the buildings on the lower site were originally wood frame construction except for the powerhouse and the majority of them were connected by enclosed weather proofed walkways. This made it possible to wear normal uniforms in most of the areas. The upper and lower sites were connected by an overhead tramway and a road that was sometimes impassable during the winter. Primary electrical power for the upper site was furnished by the primary power plant on the lower site. Radar video was sent to the lower operations area via commercial Western Electric video transmission equipment. No family housing was provided as this was considered a remote unaccompanied tour (1 year). Annual bulk supply shipments were made during the summer months under the Mona Lisa and later the Cool Barge programs. Airlift of supplies, mail and personnel was available year-round, weather providing. The Northeast Cape WACS linked to Anvil Mountain (126 miles) east and to Tin City (161 miles). Two pairs of 60' tropo billboard antennas were used. The site was constructed in 1957 and went operational on 17 Feb 1958. The equipment and power building was 5,280 square-foot and POL storage was a single 500 barrel tank. This WACS site was co-located with the Northeast Cape AC&W site and shared support facilities with them. The AC&W site closed in 1969 and thereafter the WACS site served as a link between Tin City and Anvil Mountain and provided its own support under contractor operation. The Northeast Cape White Alice tropo site was inactivated in 1972. 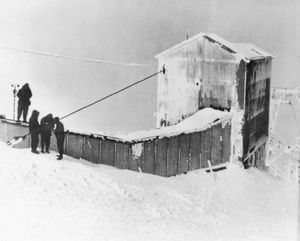 A pair of transportable 30' tropo dish antennas was added at Anvil Mountain WACS and a second pair at Tin City WACS to bypass their links to Northeast Cape when it closed in 1972. 8 Dec 1952 - Activated, 160th Aircraft Control and Warning Group. 5 Feb 1953 - Assigned to 548th Aircraft Control and Warning Group. 18 Apr 1953 - Assigned to 11th Air Division. 20 Sep 1954 - Assigned to 5001st Air Defense Group. 1 Oct 1955 - Assigned to 10th Air Division. 1 Nov 1957 - Assigned to 5060th Aircraft Control and Warning Group. 1 Jul 1959 - Assigned to 11th Air Division. 1 Aug 1960 - Assigned to 5070th Air Defense Wing. 1 Nov 1961 - Assigned to Alaskan Air Command. 15 Sep 1969 - Deactivated. Ruins of Lower Site Buildings before Final Removal. Location: Goodnews Bay Saint on Saint Lawrence Island in the Bering Sea, Nome Census Area Borough, Alaska. Denfeld, D. Colt Ph.D., The Cold War In Alaska: A Management Plan For Cultural Resources, 1994-1999, U.S. Army Corps of Engineers, August 1994, 327 pages, Pdf, page 162-164, 240-241. History of the Aircraft Control and Warning System in Alaska: Air Defense of Arctic Skies, Argonne National Laboratory, Illinois, 2002 updated 2013, 140 pages, Pdf, page 51-53. Top Cover and Global Engagement - A History of the Eleventh Air Force, page 19. This page was last modified 22:14, 28 December 2018 by John Stanton.